Why Are There So Few Female College Presidents? Lady in the Ivory Tower post by Lakshmi Sarah on April 2, 2013 – 4:27pm; tagged academia, college, feminism,presidents, university, women. Women make up a majority of college students, but at the top of the academic ladder, the percentage of women wanes: only 26 percent of college presidents are female. Why is this? The percentage of female college presidents is actually better than the stats for other positions of leadership—women make up only 20 percent of Congress. In order to gain a better understanding of some of the intricacies in of the role of college president, I spoke with Laura Trombley, the president of my alma mater, Pitzer College. President Trombley has clearly been busy and successful in her role as the head of a liberal arts college; Congress recently named her to the 12-member J. William Fulbright Foreign Scholarship Board. Instead, says Pitzer President Trombley, the gender gap comes down to both money and academic bureaucracy. One problem for women in academia is that traditional departmental structures create a narrow path to the top. For women, it is often very difficult to become department chairs, because they are usually not among the most senior faculty. “It is actually a pipeline issue. If you don’t start looking at how women can enter the administration ranks at a lower level, then you are not going to solve greater representation at the presidency level,” says Trombley. That means the problems with a gender gap at the top of the ladder stem in a large part from workers not having an equal footing when they start the climb. The gendered pay gap in academia isn’t as bad as in many careers, but female faculty members earn 19 percent less than their male colleagues—a number that hasn’t changed in thirty years. Instead of sticking around in academia for decades and following the regular academic “pipeline,” some of the most prominent female college presidents have landed through nontraditional tracks, landing the job after building successful careers in media and politics. As with all discussions of why gender differences exist at the top of the heap, we can’t just look at what’s going on at the top. The problems begin much deeper. 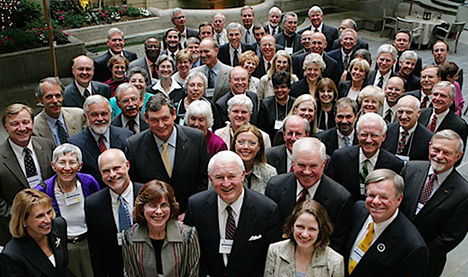 Photo of the American College and University Presidents’ Climate Commitee via Treehugger. Read the rest of the Lady in the Ivory Tower series about feminism and academia! This entry was posted on April 2, 2013 by lakisarah in B*tch Magazine and tagged college, presidents, women.